Cold soba noodles hit the spot just about anytime, especially summertime. The vibrant greens and purples in this simple salad make it a true beauty. Dressing: there are many great dressings and sauces to pair with soba. I kept it minimal for this fresh salad, using just 1 part soy sauce to 1 part sesame oil. A pinch of sugar is an optional addition. 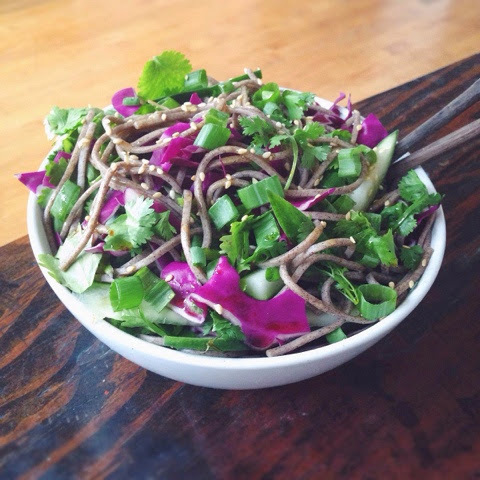 Toss cold soba noodles with cabbage, cucumber, parsley and dressing. Garnish with spring onion and sesame seeds.